One of our most popular items, this contemporary fold away drafting height table is perfect for home, office, and dormitory. The sturdy, 1 1/2" diameter tubular steel frame, is easy to set up with a powder coated finish that will provide years of service. The four telescoping legs allow the tabletop surface to easily adjust from 29" to 44" in the horizontal position and tilt from horizontal (0) to 45. Distance between legs is 28 1/4". Fold away gate hinges permit base to fold flat in seconds to 5" for convenient storage and/or transport. Base and board ship in separate cartons. 42 lbs. 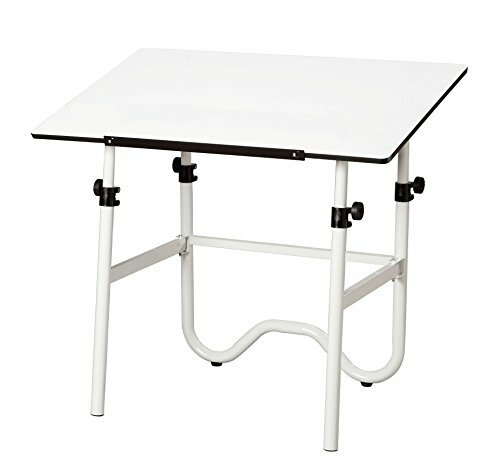 One of our most popular items, this contemporary fold away drafting height table is perfect for home, office, and dormitory. The sturdy, 1 1/2" diameter tubular steel frame, is easy to set up with a powder coated finish that will provide years of service. The four telescoping legs allow the tabletop surface to easily adjust from 29" to 44" in the horizontal position and tilt from horizontal (0) to 45. Distance between legs is 28 1/4". Fold away gate hinges permit base to fold flat in seconds to 5" for convenient storage and/or transport. Base and board ship in separate cartons. Top Size: 30" x 42"
If you have any questions about this product by Alvin, contact us by completing and submitting the form below. If you are looking for a specif part number, please include it with your message.